The fabric for this outfit has been laying in my stash since I first started this blog and so has the inspiration image. 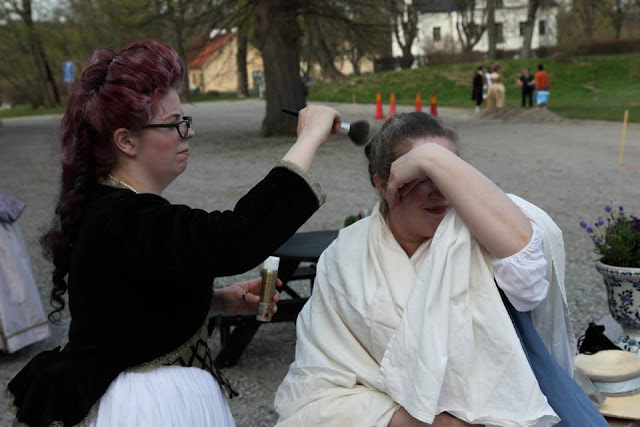 When Elisa of Isiswardobe kindly invited me to the 20th year anniversary for Gustafs skål, I knew this was the dress I wanted to wear as evening dress. I was short of time because three weeks of my planned sewing time was used to make three application projects for the teachers program at Konstfack (University college of Arts,Crafts and Design, a very prestigious school in Sweden). But I managed, although I stopped sewing at 4 am in the morning of the event and made last stiches sitting in the park of the event. 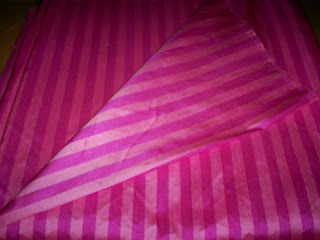 Back in 2009 I scored a fantastic striped silk duipion on Tradera (swedish version of ebay). I got 9.75 meters and the fabric was 90 cm wide (=10.6 yards of 35"). I choose a "blonde" silk organza for trims and opted for pink bows instead of green because I could not find a green that played well with the shades of pink in my fabric. I also made a much smaller bottom ruffle on the petticoat and adopted the width of the gown ruffle to look good with the shorter length I had do to because of fabric shortage. 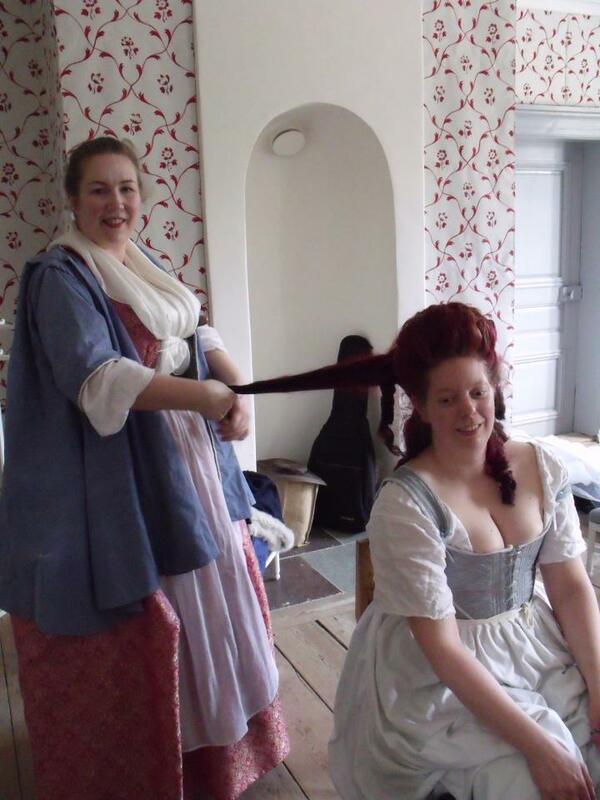 There are diffrent ways of constructing a real polonaise, I choose to do a separate corsage (bodice) and an over gown. 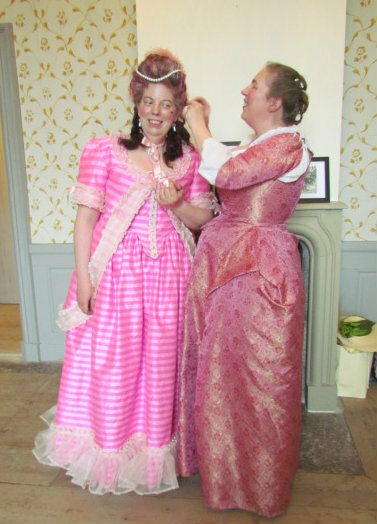 I used my standard 18th bodice for the corsage and draped the pattern for the gown by looking at the ones in featured in Cut of womens clothing. I got some fitting help from the lovely Carina, a fellow costumer in GS, Elisa, and Caroline wich is also a GS member. Since I'm a long legged vixen and wanted some serious back action for this gown I quickly realised that the fabric would no be enough for a full length gown. So I started with cutting the skirt panels, sleeves and corsage and used the remaining fabric for the gown. I mixed machine sewing and hand sewing due to time constrains but I took the time to hand sew the CF and CB of the petticoat to make sure that the stripes matched there (this is actually the only place on the whole dress that the stripes match, all the stripes was totally uneven so it was impossible to make them match anywhere else). I also hemmed the petticoat by hand. The corsage was assembled by machine and finished by hand, it closes up the front with hooks and eyes, also sewn on by hand. I choose to trim it down the front with the same rose trellis braid I used over the seams in the back of the gown. The gown is lined in the bodice area with white linen and pink striped cotton in the sleeves. I machined it together and hemmed it by hand. All the unknown meters of double box pleated organza trim was hemmed and sewn on be machine. I absolutely adore and love this dress! I feel faboulus in it and I so want o make more over the top creations in the future, subtle and understated is not my thing! I'm also very pleased with the sleeves I think I finally got a good pleated sleeve pattern. To get the serious amount of back action that is a bit exaggerated of my pose in this picture, I'm wearing a cul de paris with a quilted rump on top, I made the rump after Kendras in depth analysis found here. (I used no 3). On top of that are two petticoats and then the silk petticoat and the gown. 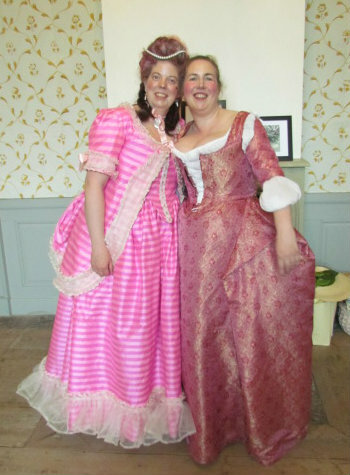 Me and Elisa, the Pink ladies 18th century style! I hope I'll have more time for blogging this following months because I really miss you, all my readers and fellow bloggers! After looking at your inspiration pic again, I wonder- shouldn't you add some more frou-frou? :D More is more, after all. 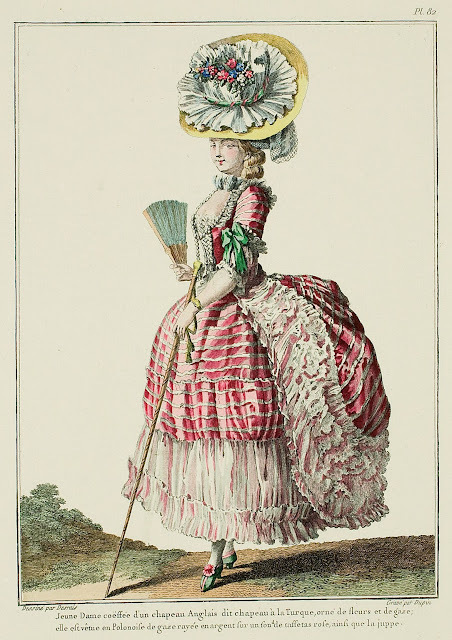 When I have more money I want to add a row of pleated organza trim above the ruffle on the petticoat and add a small ruffle on the lover edge of the original ruffle. I'm also pondering to add a ruffle on the front point of the corsage about the same width as the trim surrounding the neckline of the gown. The polonaise is exactly Marie Antoinette wore in lavender color~~~~Nice fitting!!!!! !